Environmental education issues and problems are a focus of MDG 7. For poverty reduction, universal primary education, gender equity, reduction of child mortality and improvement of maternal health, reduction of deaths from AIDS, environmental sustainability and enhanced partnerships for development, there must be sensitivity to cross cutting environmental issues as they affect any achievements that can be made in each of the MDGs. 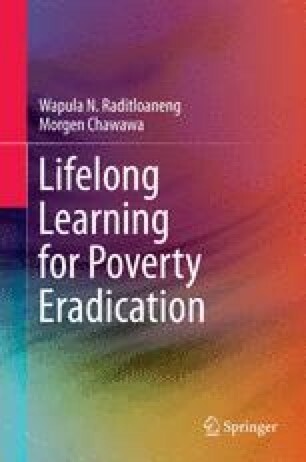 However, since the main theme of this chapter is environmental issues, the chapter contents are more aligned to MDG 7 and how environmental education is a factor in poverty reduction. The list below, though not exhaustive, provides an inventory of global environmental problems which are factors in breeding poverty and make it difficult to make a transition from poverty to non-poverty. Climate change, including global warming has resulted in, amongst others, loss of water, electricity, heat wave, and lack of surface water • Related to this is the problem of global dimming • fossil fuels • sea level rise resulting in floods, • greenhouse gas • Ocean acidification • Shutdown of thermohaline circulation • Environmental impact of the coal industry which results in diseases such as pneumonia; and • urban heat islands. Climate change is a global problem that impacts on energy and other essential needs such as water and electricity, which results in high bills to access essential goods and services that are hard to secure because eof climate change. Conservation: The conservation of natural resources is very important for agricultural production, and promotion of tourism, amongst others. Lack of effective conservation has a negative impact on, amongst others, species extinction • pollinator decline • coral bleaching • holocene extinction • invasive species • poaching and endangered species. Energy: There is a global shortage of sources of energy, which calls for energy conservation. Strategies towards energy resources include use of renewable energy, renewable energy commercialization, efficient energy use to curb environmental impact of the coal industry and the environmental impact of hydraulic fracturing. Environmental degradation: Environmental degradation has a bad impact on survival of human and animal species due to impacts of eutrophication •habitat destruction •and invasive species that indiscriminately breeds extinction of others. Genetic engineering: There are problems of genetic pollution, and genetically modified food controversies. Genetically modified (GM) foods are foods derived from genetically modified organisms. Genetically modified organisms have had specific changes introduced into their DNA by genetic engineering techniques. These techniques are much more precise than mutagenesis (mutation breeding) where an organism is exposed to radiation or chemicals to create a non-specific but stable change. Other techniques by which humans modify food organisms include selective breeding (plant breeding and animal breeding), and somaclonal variation. GM foods were first put on the market in the early 1990s. Researchers have also developed a genetically-modified breed of pigs that are able to absorb plant phosphorus more efficiently, and as a consequence the phosphorus content of their manure is reduced by as much as 60 %. Intensive farming: Some farmers breed more animals in spaces not adequate for their populations. This leads to overgrazing, soil erosion and infertile soil for gainful arable agricultural development. Due to the dry climatic conditions and lack of surface water, the need for irrigation cannot be overemphasized. Arid conditions have resulted on monoculture where only drought resistant plants can survive. There are also environmental effects of meat production especially where there are diseases that affect livestock, and the need for proper application of plasticulture. Land degradation: With the impact of globalization came many chemical and non- chemical land and air pollutants, soil erosion, soil contamination and salination by toxic nutrients and desertification. Land use is adversely affected by rural-urban migration, urban sprawl • habitat fragmentation leading to habitat destruction especially where there are controversies surrounding ownership and access to land. Water and air pollution — Environmental impact of the coal industry is manifested in acid rain • Eutrophication • Marine pollution • Ocean dumping • Oil spills • Thermal pollution • Urban runoff • Water crisis • Marine debris • Micro plastics • Ocean acidification • Ship pollution • Wastewater • Fish kill • Algal bloom and mercury in fish • Environmental impact of hydraulic fracturing. Other challenges and problems include environmental impact of the coal industry nonpoint source pollution point source pollution light pollution • Noise pollution especially in the inner cities, and visual pollution. Air pollution includes environmental impact of the coal industry, smog tropospheric ozone, indoor air quality, volatile organic compound atmospheric particulate matter. Reservoirs: These are crucial for rainwater catchment and storage but need proper maintenance and purification measures especially where there are water borne illnesses. Environmental impacts of reservoirs can be fatal and deadly if uncontrolled. Resource depletion: This includes over- exploitation of natural resources, clear cutting • deforestation, illegal logging and over-drafting. Consumerism: Use of environmental resources by commercial entities who want to maximize profit can lead to consumer capitalism, planned obsolescence, and over-consumption of plant and animal species. Fishing: Fishing is common in areas where there are seas, lakes and rivers that hardly run dry. Fishing typologies include blast fishing bottom trawling cyanide fishing, ghost nets, illegal, unreported and unregulated fishing, overfishing, shark finning, and whaling. Mining: Mining is very lucrative source external revenue in Botswana and other African countries. However, associated environmental problems include acid mine drainage, environmental impact of hydraulic fracturing, mountaintop removal mining, and slurry impoundments. Waste: Solid and liquid waste products include heavy toxic metals, pesticides, herbicides, electronic waste, litter, waste disposal incidents, marine debris, medical waste, landfill, leachate, environmental impact of the coal industry, incineration, great pacific garbage patch, exporting of hazardous waste, environmental impact of hydraulic fracturing.